What if some of these these free, all-too-easy-to-grow uninvited guests were so nutritionally dense that they are just about the healthiest things you could possibly eat: higher in vitamins, anti-aging antioxidants and omega-3 fatty acids than cultivated plants? There are of course also many poisonous plants, so proper identification is essential! 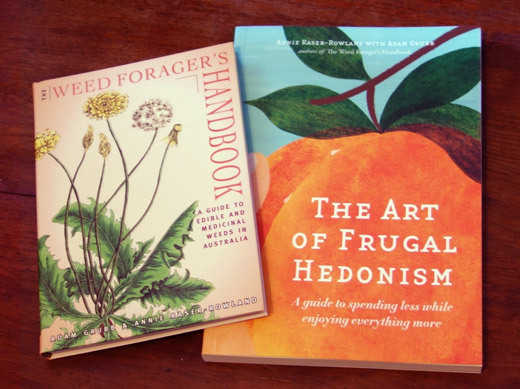 Get a copy of our book, The Weed Forager’s Handbook: A Guide to Edible and Medicinal Weeds of Australia, study our weed gallery from this website and have someone who knows the weeds assist you. 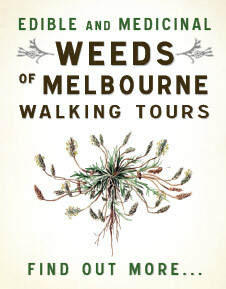 If you’re in Melbourne come along to one of our edible weed walks, or find a local enthusiast. But what exactly is a weed? The textbooks usually define a weed as ‘plant which is growing where it is not wanted’. One culture’s ‘weed’ can be another’s valued crop or a sacred medicinal plant. So you also have a choice: two ways of doing the weeding… One involves back-breaking work or toxic sprays, and the other a simple mental reclassification! Perhaps the most iconic of all weeds, the dandelion is also one of the most nutritious plants on the planet, high in minerals, vitamins and antioxidants. All parts are edible, from the oh-so-decorative-in-a-salad yellow petals, to the root, which can be slow roasted and used as a coffee substitute. The freshest looking young leaves are lovely cooked, or make an excellent addition to salads for those that like bitter greens. Those antioxidants have cancer fighting power. An easily identifiable weed; one can do it by touch alone, for they carry a fierce sting! If dried, or wilted in boiling water for 30 seconds, they lose this disagreeable feature and are transformed into a highly nutritious cooking green. 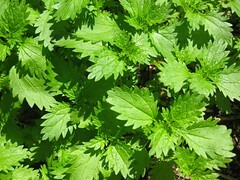 Nettles are extraordinarily high in calcium. Strip the young leaves from the stems and use as a spinach substitute — one of such a deep chlorophyll green that it’s easy to appreciate their reputation as a blood tonic. The dried leaves are used for tea, and nettle gnocchi with sage butter is a classic. The sting is used to treat arthritis, and the roots used for enlarged prostate. One of the first plants to colonise bare earth over the warmer months, this prostrate semi-succulent, with its jewel-like leaves and reddish stems is another nutritional superstar, and one valued in cuisines in both the Middle East and Mexico. 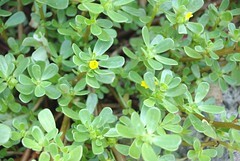 Purslane has a crisp, tart flavour, and more omega-3 fatty acids than any other leafy green ever tested. Cooked, it excels in tomato dishes. Raw, it’s a great foundation for salads or tzatziki-style dips (we’ve a delicious recipe in the book). Yoghurt also neutralises this plant’s oxalic acid. This delicate cool season herb is a common volunteer in the veggie patch for it likes moist rich soils. 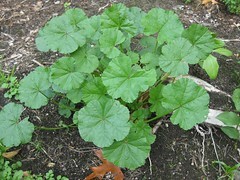 The taste is very mild, and it is highly nutritious, being particularly high in iron, vitamins A and C and antioxidants. Harvest just the tops with scissors for the youngest leaves, which are good in salads, sandwiches and pestos. 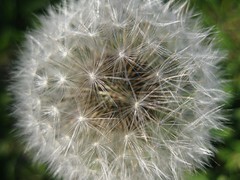 Look for the single row of hairs along the stem as an identifying marker to distinguish it from its many look-alikes. 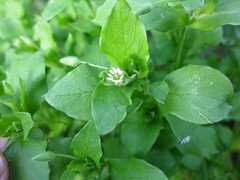 Chickweed in an ancient remedy for rashes and other skin conditions, used as poultice or ointment. 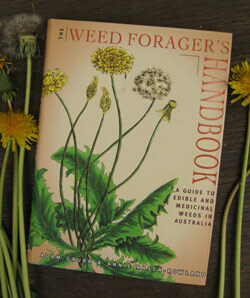 We cover all these and many more in The Weed Forager’s Handbook, and on the edible weeds workshops. 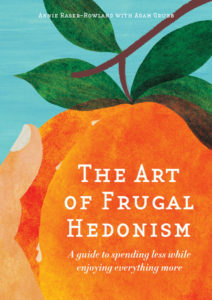 It’s genuinely fascinating learning about this stuff, so we hope you get a book and we see you at a walk or workshop!